Often overlooked, the overall classroom environment plays a significant role in a student’s learning. While the traditional way of teaching may be convenient, it is good to go outside the box and provide students with new methods that will surely inspire them, give them a sense of belonging and enable them to connect with others. Creating interactive learning spaces helps them grasp further information quickly and retain more material. Let’s take a look at some ways that will help you create an interactive classroom experience. Technology has become an essential part of our everyday lives. Even children, at a young age, are now comfortable in using technology. It’s a great thing to incorporate this to your teaching style to promote interaction and higher learning. Teaching should no longer be a static activity. You may utilize gadgets such as tablets, smartphones or even a Smartboard as alternative tools. You can play online videos, educational games or do video-conferencing to another class in another city to build interaction while helping them learn new information. Studies say that students learn faster and interact better when they feel comfortable. Make sure to keep the classroom tidy and tackle any cleanliness issues immediately. To make them at ease, you may also include other elements such as displays of student artworks, plants, and pets that would make them feel somewhat at home. 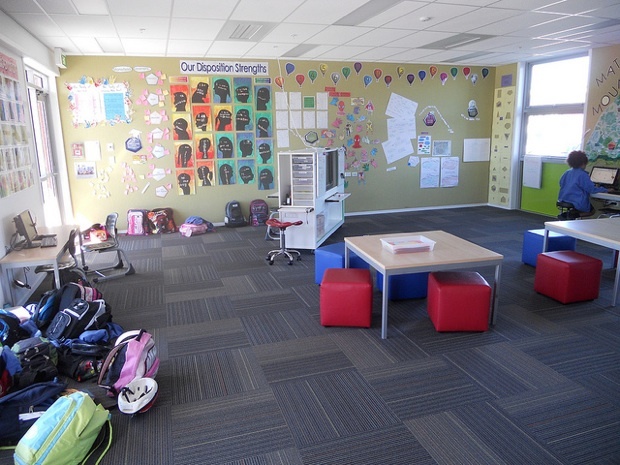 Breakaway away from the usual classroom layout cause there are new ways to set up your classroom that is more fit to the 21st-century type of learning. You can have the seats arranged like a boardroom. Have the desks face-to-face each other to let students see each other rather than having them facing you all the time. That way they’ll be more likely to engage with each other. See also to it that you have allotted space for recreational and project-based learning where students can move freely. Shake up the traditional classroom experience and use a differentiated approach. In this way, you get to tailor-fit your teaching style to your student’s learning capability. Assess each student and put them in small workgroups that provide them the opportunity to learn from each other. Then, have them show what they learn in their own chosen ways. This method steers away from the one-size-fits-all approach where one teaching format might not match everyone. We can all agree that learning is still, a complicated process. Therefore, it is great to collaborate with experts that have experience in wireless presentation solutions and can provide a scientific and cognitive approach in creating interactive learning spaces for your students. Make it easier by trying new methods that are more interactive and can promote faster learning. Your students will find it more engaging when they get to learn in a variety of ways.